We are excited that you are planning on ordering from our farm! We have added several new features to help expedite the online ordering process - especially during the busy holiday season! If you can take a moment to browse through our help section below before you start your order, particularly if you are planning to order and send gift baskets to multiple addresses or you would like to order the same basket to be shipped to multiple locations, you might save us both some time! Thank you for taking the time to do this step so that we may deliver your orders on time and efficiently! Baskets are shipped overnight Monday-Thursday. A 72 hour lead-time is required to ensure the best assortment and freshest produce. Gift baskets can be shipped anywhere in the U.S. (except Hawaii). Saturday delivery is an additional $10 and must be placed via the phone at 1-800-932-4252 before 5:00pm on Thursday. You will be asked upon Checkout for your desired date of delivery as well as any special instructions for your order. The shipping methods may vary depending on the shipping address. Deliver times for FedEx are quoted as per their website. FedEx Standard Overnight is available for any shipment and will be delivered by 3:00pm the following day. FedEx Priority Overnight is available for any shipment and will be delivered by 10:30am the following day. FedEx First Overnight is available for any shipment and will be delivered early morning the following day. Exact time is dependent on the recipient's address. Local Delivery is available for the following zip codes only; . The flat rate for local delivery is $5.00. Pickup Only is available for Ventura County residents that would like to pick up their purchased gifts at our Moorpark or Somis locations. There is no charge to pickup your order. Please note that our Moorpark location has limited hours during the month of December and will be closing for the season mid December - March 1, 2019. For specific hours and times please visit our Moorpark Farm Center page. Our gift baskets contain the freshest produce available, all packed the day of shipment. Each week Underwood’s Harvest Assortments vary in contents and are made unique by including items in season at the time. A list of possible combinations and the gift tag that is included in your gift basket order can be found at the links below. All orders must be received by 5:00 PM PST on the cut-off date. Please note that our Moorpark location will be closing on December 16, 2018 for the season. We will re-open on March 1, 2019. During that time all local pickups must be done from our Somis location. If you are here to order multiple or corporate gifts with us - thank you! 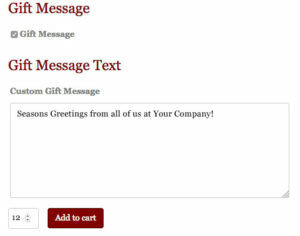 We've added the functionality to purchase numerous gift baskets and send them to different locations. We hope that the guidelines offered below will help you with the ordering process. Payment: At this time Square does not allow to ship to multiple destinations. If you would like to use this feature you must select PayPal as your payment method. If you do not use PayPal, the order will fail. Gift Messages: If you would like to create a unique message to accompany each basket, no problem! Just be sure to add one basket at a time to your shopping cart and recall the order of which you entered your custom messages so that when the time comes to indicate the shipping address you are able to connect the two. If you are using a generic greeting for all of the baskets, that's even easier! 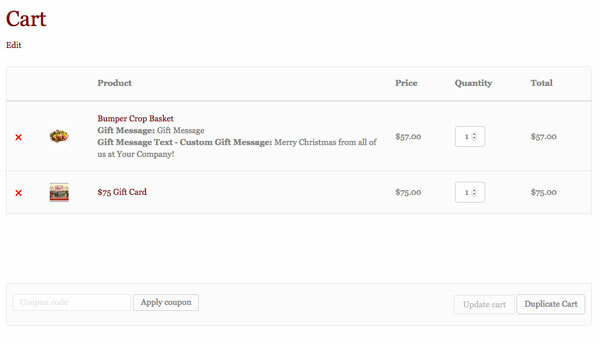 Just add the baskets to your shopping cart and indicate the message in the box on the gift basket product page. Shipping Addresses: After adding baskets to your Shopping Cart and you are ready to begin the Checkout Process you will see the message as it appears below. Click on Set Addresses to proceed. 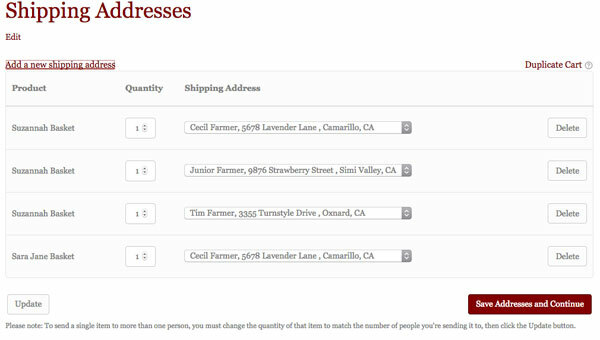 By clicking on Add a New Shipping Address you will be able to create the appropriate number of shipping addresses. When you have added ALL addresses, you will be able to match up the basket with the proper shipping address on the screen as shown below. Please note that while you are in the process of adding the addresses that the drop-downs may randomly change, that is why it is important to wait until you have finished adding all the shipping addresses first. Next, select the correct address with the corresponding basket by selecting it in the drop-downs as shown below and then click on Save Addresses and Continue. This will redirect you back to the Checkout page to complete your order. Be sure to indicated your desired date of delivery. Please remember that because we are shipping fresh produce that we require 72 hours notice and ship out Monday-Thursday typically. We do have a Saturday delivery option, please see the Gift Basket Arrival Dates & Shipping Methods section on this page for more information on those details. On the bottom of the Checkout page as show below you will be able to select the applicable shipping method for each basket. This feature works very similar to the multiple shipping. Please note that you must use PayPal as your payment method or the order will fail. 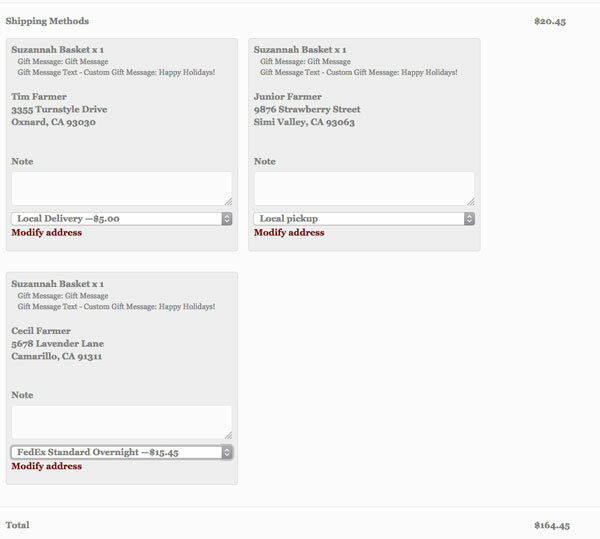 The advantage of using the Duplicate Cart feature is that you can create a cart with multiple items and ship it to multiple recipients. So for example if you wanted to send a gift basket and a gift card to multiple family members or customers this method is much easier. 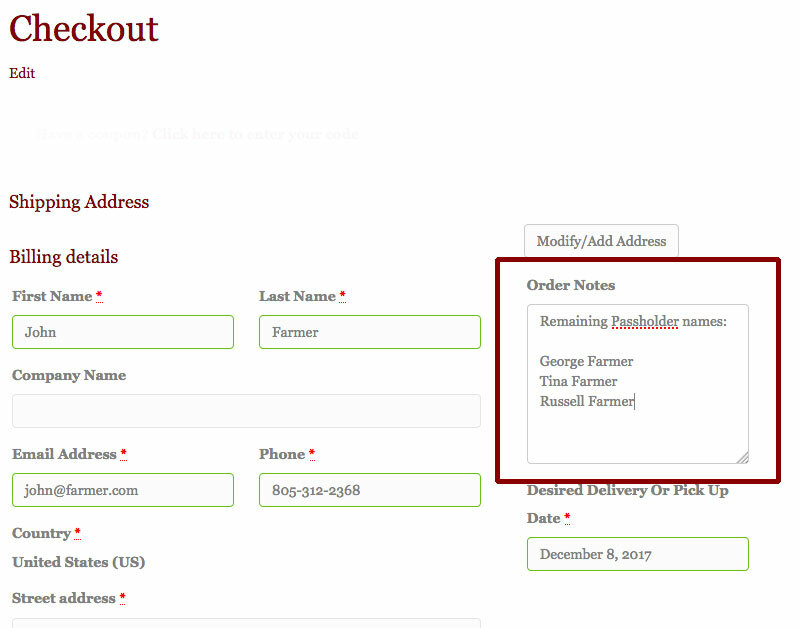 Create your card by adding items and then click on the Duplicate Cart button in the lower right as shown below. This takes you into the screen where you can either select addresses you have already saved (if you have shipped with us before) or add new addresses. 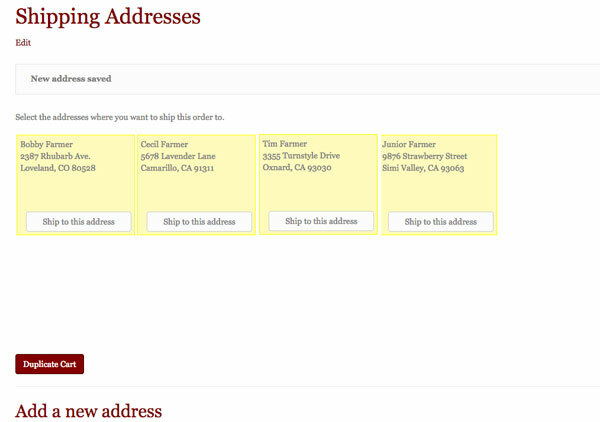 Once you have added all the addresses you intend to ship to, click on Select This Address and the box will light up in yellow as shown on the example below. 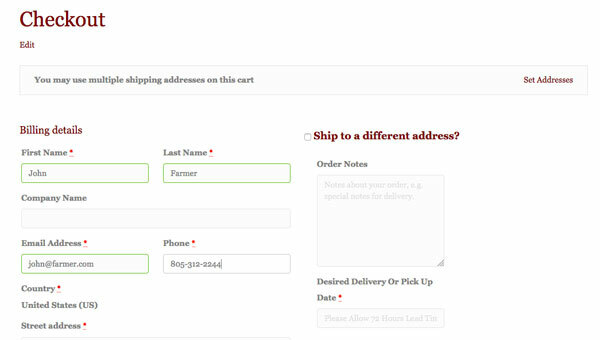 One click on the Duplicate Cart button sends to the Checkout page to complete your order by selecting the ship to methods to each of your recipients. When ordering Season Passes, please fill out the Passholder Name field for each pass and select the quantity of passes you wish to order. NOTE: If you are ordering more than 5 passes at a time, then please just add the additional passholder names in the Order Notes field on the Checkout page (shown below). We are happy to offer our online customers gift cards in the following denominations; $25, $50, $75 and $100. If you would like to order a gift card in another denomination you must call the farm directly.